Le Petit Chвteau – “The Little Chateau”, that is how the owner of this unique mansion on the Bulgarian Black Sea coast has called it. The house was executed in the spirit of French Provencal chateau. This magnificent property consists of a beautiful villa with 7 bedrooms, built in the style of a French country house, vineyard, own wine cellar for wine production and small farm used for growing organic crops and keeping animals for their own needs. The whole estate is situated on 5,000 sq.m. private land, about 2 km away from one of the most elite places on the Bulgarian Black Sea – the resort of Lozenets. Known as "The Bulgarian Saint-Tropez", Lozenets is a favourite seaside resort for wealthy intelligent Bulgarians, celebrities, musicians, singers and artists as well as many successful professionals and middle-aged top managers. Everyone has been in Lozenets and felt its atmosphere can make a difference and see the contrast with some known commercial and popular resorts such as Sunny Beach and Sozopol. In a word, Lozenets is a place for recreation, which an intelligent man, esthete and connoisseur would has chosen for yourself, your family and your loved ones. Peace, tranquility, absence of obvious swank, sophisticated atmosphere, pleasant environment of smart, successful and positive people. Chic restaurants and bars, where you can meet the most successful Bulgarians - intellectuals, artists, actors and honoured businessmen. And more - lovely sandy beaches, natural beauty, clear and clean sea, pleasant climate. Many interesting places in the area, where even for a moment you will not get bored – The Strandzha Mountains with its picturesque villages, the mouth of the Veleka river and Ropotamo, natural reserves, numerous historical monuments and landmarks. This combination of qualities characterized Lozenets is unattainable for any other resorts and destinations on the Bulgarian Black Sea coast. 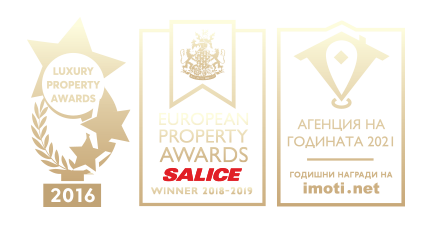 This is one of the reasons why here land and property prices hold higher levels and the demand for quality properties is higher in comparison with some other elite resorts with better infrastructure such as Sveti Vlas, Nessebar and the resorts near Varna. The villa in “The Little Chateau” consists of 3 levels with a total area of 416 sq.m. The villa was built in 2010 with materials of high quality in according to modern technologies, natural wooden flooring, stone, clinker, quality tiles, etc. It is important to note that the owner has built the property for personal use of himself and his large family - no compromise has been made in the construction and furnishing of the property. The furniture is custom-made mainly from natural materials and wood using quality technologies. All necessary communications are provided - electricity, water, sewerage. The property comes with internal and external insulation, local heating/solar panels, internet, cable TV, modern security system with CCTV surveillance. The heating system consists of a solid fuel boiler and radiators in all rooms as well as a fireplace in the dining room. The water is heated by an integrated system of boiler, electric water heater of 300 liters and solar collectors. There is no air conditioning as it is not necessary, because there is very good insulation – it does not require cooling during the summer and heating expenses in the winter time are minimal. The annual utility expenses are approximately: electricity - 1600 Euro; water - 150 Euro; local taxes - 680 Euro. The property is mainly used during the summer months. Some of the furniture are unique with antique value, especially selected and purchased from Italy and France. The owner of the mansion is esthete, connoisseur and expert on expensive and quality items. Therefore, in the mansion can be found wonderfully restored objects and devices from the past that perform well until nowadays – such as motorcycle Simson of 1950, Italian artwork stoves, various musical instruments from Bulgaria and the Western Europe. The villa is offered for sale fully furnished, with almost all furniture and appliances included in the price. The seller would like to keep some favorite objects and tools with emotional value, in which he has put a lot of effort and energy in their finding and recovery. It should be mentioned other features of the property - a large pool, a covered barbecue area with fireplace, vineyard with varieties for the production of its own wine, vegetable and fruit gardens, farming – 3,000 sq.m. of vineyard with selected five-year vines, 800 sq m. orchard and vegetable garden and farm, equipped with modern drip-irrigation system for lawns and vineyards. There is a garage for two cars and parking for three cars, a wooden bungalow for staff with two rooms and a bathroom, security house and all surrounded by a decorative fence. The distance to the centre of Lozenets and the beach is about 2 km. The resort can ne reached by a good road for about 5 minutes by car. The place where the mansion is located is quiet and secluded, at the foot of the Strandzha mountain, just about 300 meters away from a pond. The house and throughout the property offer beautiful views of the sea, mountain slopes and the lake.